1761 – An afternoon walk to Zografou. Day one, part three. In the kiosk at the entrance of Vatopediou we received a detailed description of the walk to Zografou from a very friendly, hospitable monk. He houses as a guard in a little office just behind the entrance gate. He telephoned to another monk and asked for a print of the walk. What an amazing service, as if we were tourists. He almost seemed worried that we would get lost. 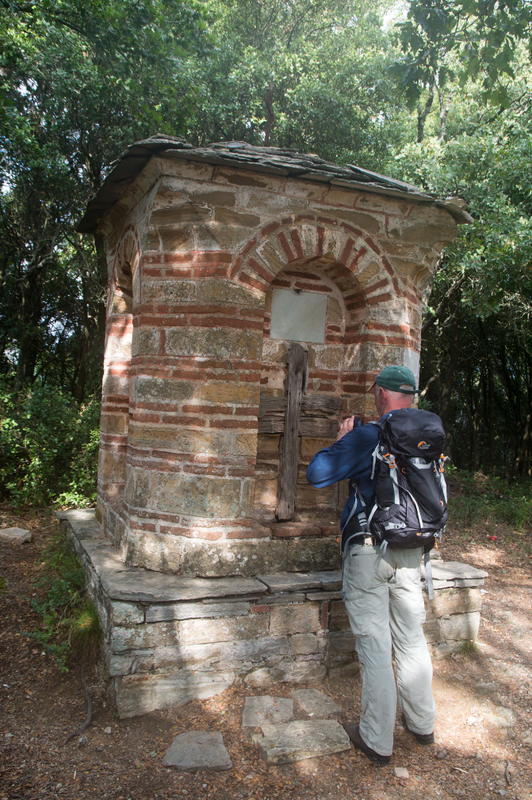 The accurate description of the walk was made by the Friends of Mount Athos (FOMA). I felt satisfied that I became a friend of the Friend’s. 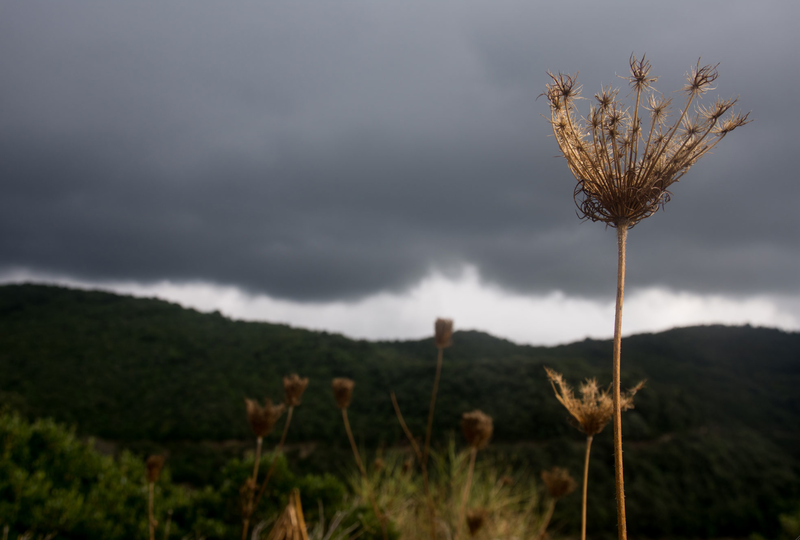 Though the description deprived us from the opportunity to wander around endlessly, get totally lost and spend the long and shivering night among the wild boar and creepy crawlies in the Athonian woods. 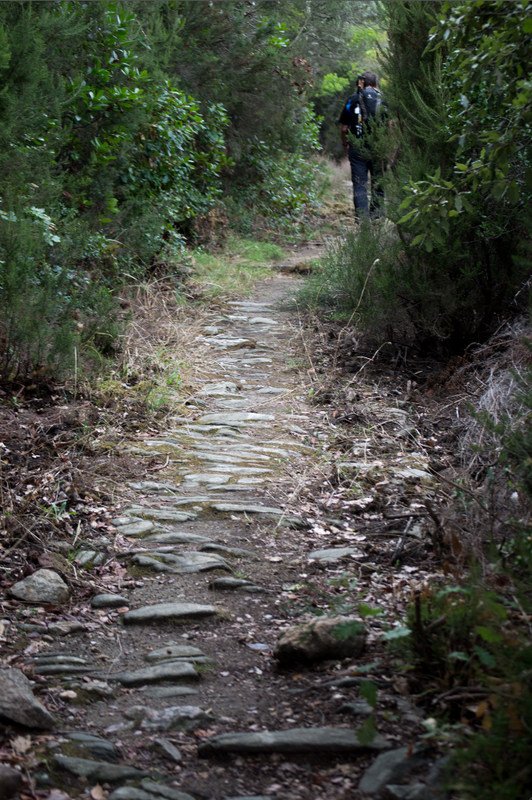 The path starts climbing up after the stream with a modern concrete footbridge through an olive orchard. It is always an amazing experience how soon you gain height and a beautiful view opens up. Here we look down on Vatopediou. In the background the ruins of the Academy and the aqueduct can be seen which we visited earlier that day. Progress and change can also be seen in the orchard. 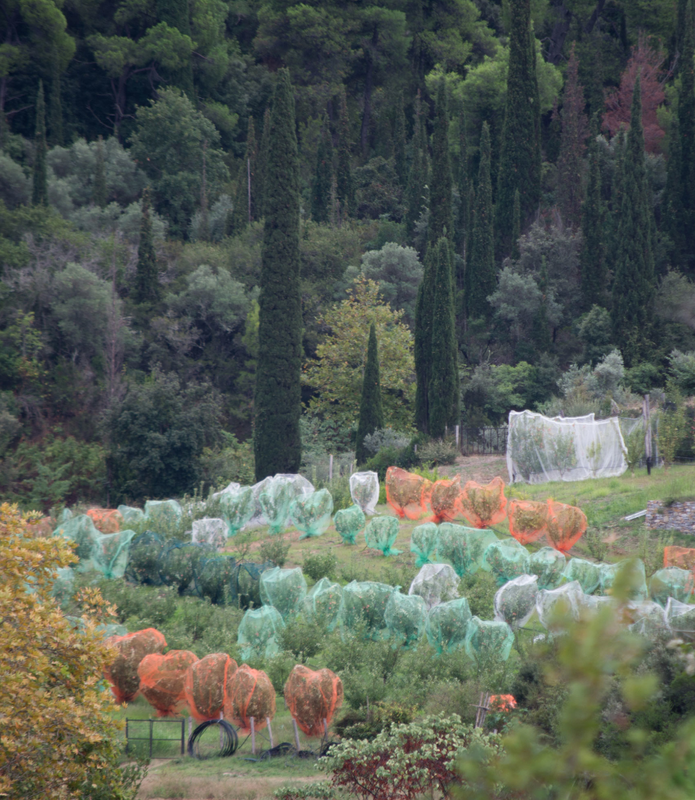 Here the fruit trees are covered in different coloured nets as dots of paint in a modern art work. Probably to prevent illness or to prevent some kind of fructification, I thought first. But when I looked more carefully zooming in as a photo detective I saw ripe fruit hanging from the small trees, probably apricots or peaches. So it will most likely be a simple protection against birds that are looking for a fruity lunch. Above the olive trees the ancient monopati (footpath) starts. 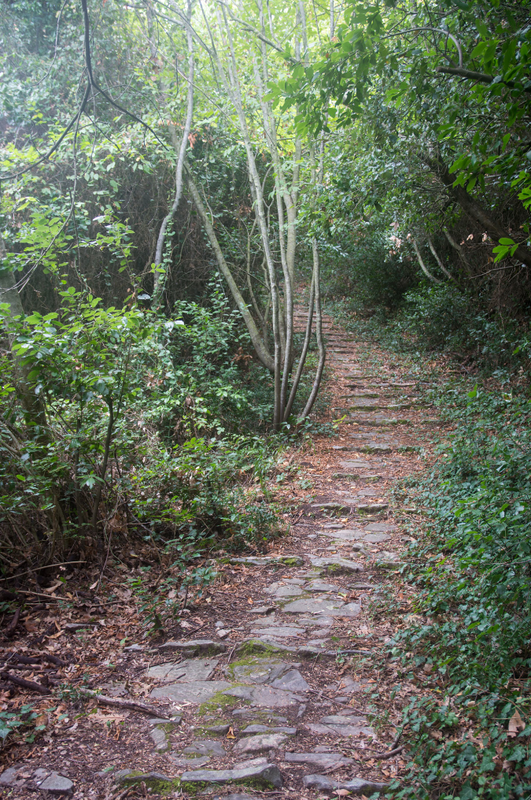 The natural stones form the pavement since maybe a thousand years, since the first monasteries. Vatopediou was first mentioned in the year 985. I always think that these monopatia must be from the same period. 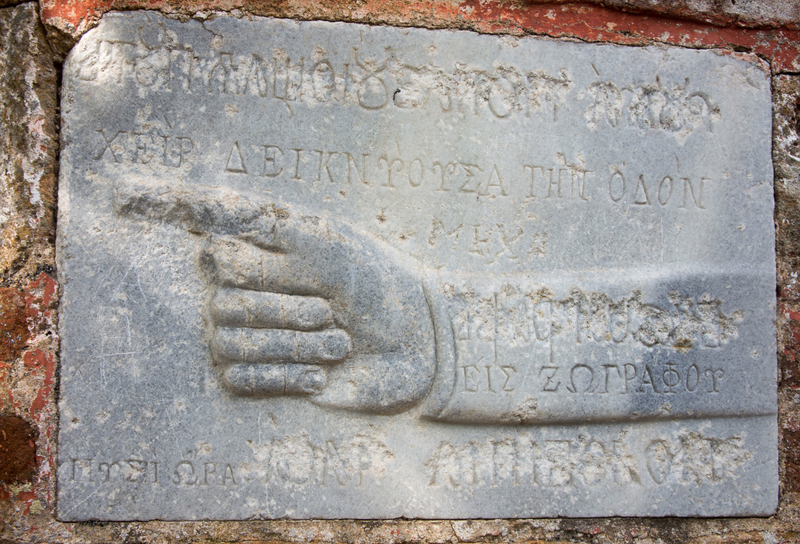 Essential connections between monasteries. The only routes to transport goods, food, stories and ideas. By foot or mule. Sometimes part of the pavement is gone. Hidden under earth, bushes. Sometimes the stones have disappeared, or maybe were never there. The Chera-crossing (hand) is a magical point in the walk. Here the monopati from Esfigmenou/Chilandariou to Karyes and from Vatopediou to Zografou meet. 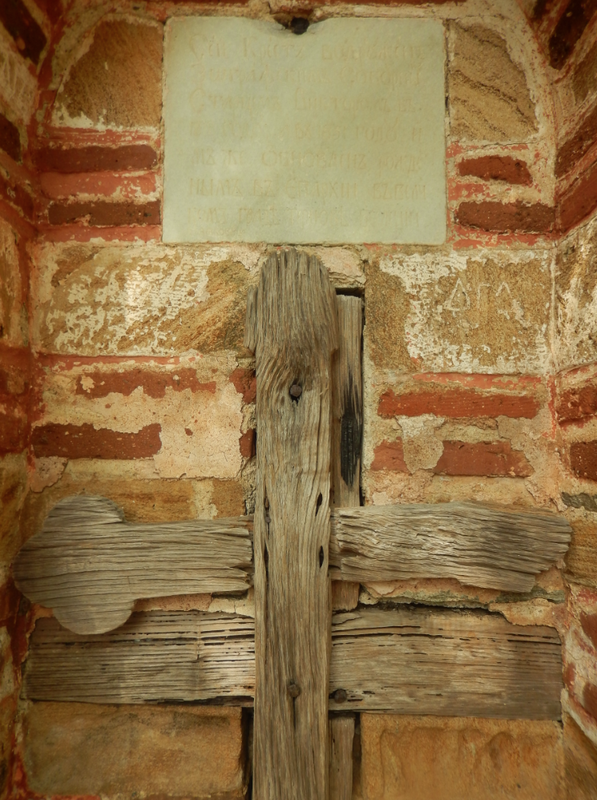 It reminded us to that other magical crossing: Stavros where the climb to the top of mount Athos starts. We had a good rest here having climbed 350 meters in one go. The rest of the walk would be easy going down. There was one other man sitting on the stones. Silently resting, smoking and drinking. When we looked again he had vanished without a greeting. Herman already made an interesting post on the Chera crossroads. In addition I would only like to point your attention to the anatomy of both the hands. Please do try to copy the position on the picture with your hand in front of the computer screen. And see what happens. There seems to be a rather complicated relation between the thumb and the forefinger. 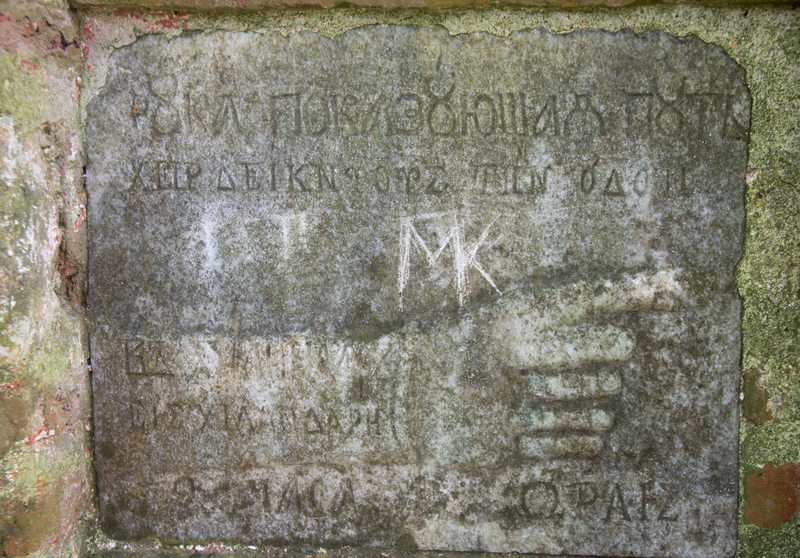 That young man who left his initials “MK” on the signpost just above the forefinger shows no respect to this sign, to the historic meaning of this place or to the artefacts that are here in the open, without any protection. Graffiti has a place in big cities. But not here. Leaving your initials here is a total opposition to the humble and “non-ego” way the monks live. The crossroad itself is marked with a square folly constructed with stones and bricks with the pointing hands on both sides and crosses on the other sides. Pilgrim Herman has took this picture. Soon after the Chera-crossing the monopati turns into a dirt road. That’s a pity. The dirt road lacks the intimacy of a monopati under the dense trees. We were fully compensated by a fascinating pack of clouds that refused to release its content. The last stretch to Zografou is to our luck again a monopati of great splendour. My favourite writer about old paths is the Englishman, Robert McFarlane, “The Wild Places” and especially “The Old Ways: a journey on foot”. He would be delighted and fascinated to step in the ancient monks footsteps. 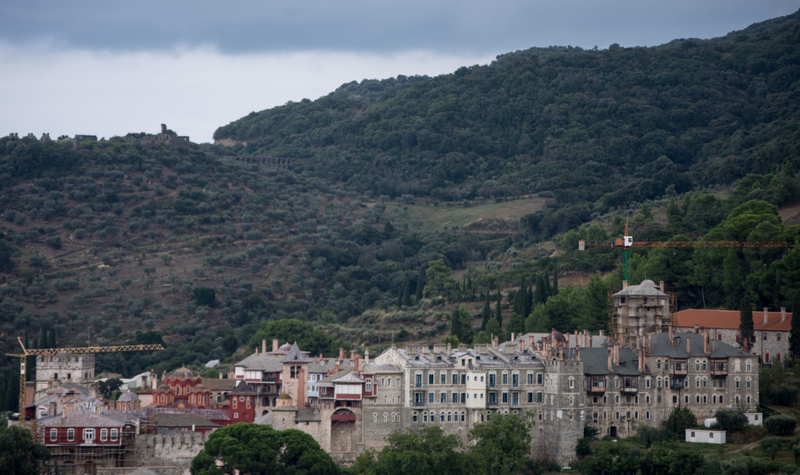 I would truly like to read his impressions on the splendour of the monopati that are still in the heart of Athos. Maybe the Friends could invite him once. This entry was posted in 02 Vatopedi, 09 Sografou, trip 2015, walking and tagged Chera, monopati. Bookmark the permalink. 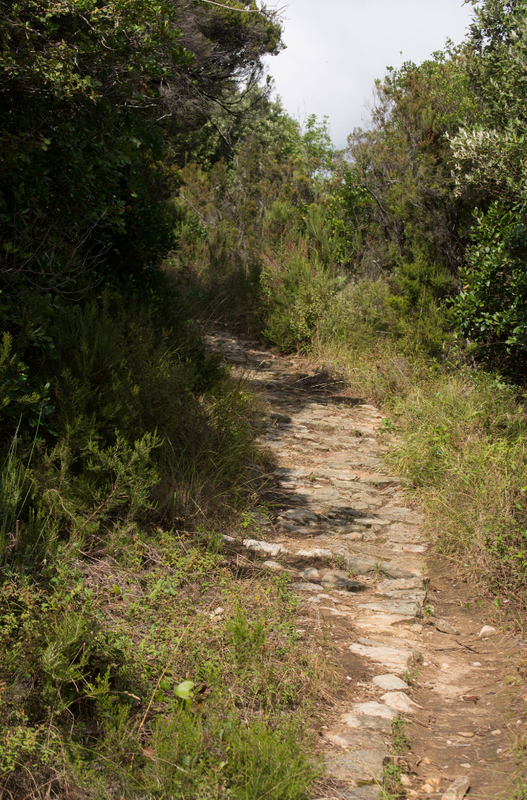 2 Responses to 1761 – An afternoon walk to Zografou. Day one, part three.